DogGone Right! Inc. was founded by Margaret Pender in 2004. 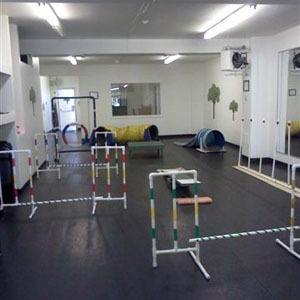 It began as an In-Home Private training, dog walking and home boarding service and has matured into a full time pet dog obedience training and behaviour counselling service. Margaret is the Owner, Head Trainer and Behaviour Consultant for DogGone Right! Inc. The Danforth training location (pictured on the left) officially opened in October 2011 and is minutes away from the Beach at 3198 Danforth Avenue, just east of Victoria Park. Our DogGone Right! location is quiet, private and climate controlled, offering you just the right atmosphere to learn in and teach your dog in all seasons. Map and pictures. About Margaret Pender: How I came to be a Trainer and owner of DogGone Right! Inc.
Margaret spent most of her childhood around dogs, and a menagerie of other animals. Her father often joked about putting a sign on their front lawn saying 'Pender Zoo - Admission 5 cents'. With the love of dogs later in life, Margaret adopted a number of shelter/rescue puppies and dogs with different behaviour problems and became the 'go to' person when friends and neighbours were having difficulty with their dogs from basic obedience to behaviour problems. One of her dogs, Zach, a Shepherd cross, developed people aggression. This spurred Margaret to learn more about dogs and their behaviour by taking courses, attending seminars, and reading books by such well known trainers and behaviourists as Dr. Ian Dunbar, Pam Reid, Pat Miller, and Patricia McConnell. In 2000 Margaret adopted Angel, a Shepherd cross with severe Separation Anxiety and some fear issues. Angel challenged her but Margaret was able to live up to that challenge, learn from it and made her even more determined to find out more about dogs, dog behaviour, and as much as she could about classical and operant conditioning, counter conditioning, desensitization and problem solving. All of this led to Margaret becoming a full time professional trainer in 2004 helping others with their dogs from obedience training to behaviour counseling which she is extremely proud of. Angel is friendly with strangers, children, and other dogs and loves running around with the most recent addition to the family, Molly a Golden Doodle. In 2008 Margaret and DogGone Right! Inc. partnered with Jennifer Ego and the Pawsitively Pets Kids Camp. At Camp Margaret works with the Young Pups (5 to 7 years old) and the Cool Catz (8 to 9 years old) teaching dog safety and providing them with hands-on interactive training experience with dogs. In 2011 in addition to working with the Young Pups and the Cool Catz Margaret added teaching/certifying the Mini-Vet campers (12-15 years old) Pet First Aid and acted as the Head Trainer for the Pilot project of Junior Dog Trainer Program at the Toronto Humane Society, in a highly specialized program where children (10 to 14 years old) learn how to train shelter dogs in basic obedience and learning the ins and out of positive reinforcement, clicker training and timing of rewards helping the shelter dogs to have a successful journey to their new home! The Junior Dog Trainer program has become so popular that in Summer 2012 it will be offered at both the Toronto Humane Society, and Toronto Animal Services North Shelter. Margaret will be devoting the majority of her days to the program splitting her time between each location. Margaret renovated and opened the Danforth DogGone Right! training Centre in October 2011 where she has been holding pet dog obedience classes, Pet First Aid courses, Agility classes (both for inexperienced and competitive handlers) and recently added Sport Scent Detection classes and Rally Obedience (RallyO).